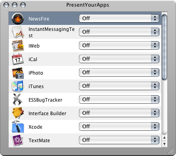 PresentYourApps is donationware, which means it's free. However, if you like it, we would very much appreciate if you considered making a donation. PresentYourApps can be downloaded here, it requires Mac OS X 10.4 or higher (Leopard compatible, Universal Binary). One small click for man. One giant change in screen space. Select the setting for the app you want to change, the application will restart and you're done.